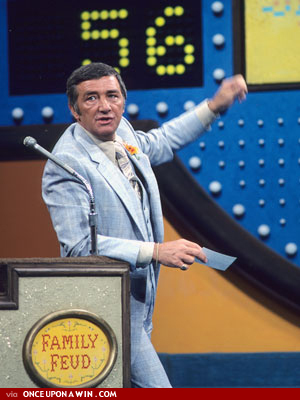 I can remember the television game show from the 70s, Family Feud, hosted by Richard Dawson. When a contestant gave an answer, he would turn to the display board and call out loudly, “Survey says…!” after which the answer would appear. Consulting surveys might work on a game show, but should we consult them to determine the validity of a Christian practice as important as evangelism? While I understand that surveys have a certain weight of authority, I find it disconcerting that one is trusted so much. Can it have more authority than inspired Scripture? After all, surveys are only as good as the reliability of the people who are being questioned, and those people are fallible. They may say they came to faith, but how can we be certain that they have not been misled into thinking that they have genuine saving faith? Were they truly converted? How do we know for sure? We cannot just take somebody’s fallible word for it. We have to rely on Scripture as our sole infallible authority, interpreting all human findings in its light. When we do turn to Scripture, we see that the use of friendship as a tool to win the lost is not even hinted at in the Bible. The blogger I mentioned made the point that Jesus made evangelism some sort of discipleship process, using relationships as the conduit through which he taught the truth. A certain aspect of this was true in the case of his disciples, since he did in fact teach them throughout his relationship with them. Having said that, it must be quickly pointed out that nowhere in the gospel accounts are we told that Christ pursued pre-teaching, pre-evangelistic relationship-building–either with his disciples or with anyone else he preached to. The same is true of the apostles: Preaching was the chief priority for them, as Paul made clear about his ministry in 1 Cor. 9:16 and the other apostles made clear by their examples in the book of Acts. When they pursued relationships with people, it was with those who were responding favorably to their preaching. So, there is a contradiction between the survey and the Bible. The survey implies that friendship evangelism is spiritually effective while cold-contact evangelism has very little effect at all. The Bible, however, says nothing about the former while speaking of preaching and cold-contact evangelism favorably throughout its pages. Which, then, should we trust? They both cannot be right. If we believe that the Bible is inspired and because of that inspiration it has divine authority, then we must submit to its teaching and not a man-made survey that is entirely dependent on the word of fallible human beings. Furthermore, true friendship is what is needed here. We cannot claim to be someone’s true friend unless we share with them what gives us life and joy. At the same time, our intention is to be their friend, not to get some sort of badge for getting another one saved. Discipleship is a relational, friendship dynamic. That raises an important question, though: Must we have a friendship with someone in order to tell them the good news? If we say yes, we are doing many a grave disservice because we cannot have a friendship with everyone. It cannot be overstated: Neither Jesus nor the apostles ever considered or made friendship a prerequisite for evangelism. The church needs to stop trying to figure out the kingdom of God scientifically and instead simply do what God says: Proclaim the gospel. How should we do outreach? When should we proclaim the gospel, and when should we reach out in acts of love and kindness? Is there any particular order in which we should do them? To answer these questions, many rightly point to the example of Christ. In his public ministry, Jesus befriended sinners so much that his enemies called him “a friend of tax collectors and sinners” (Matthew 11:19, Luke 7:34). He mingled closely with the very ones who were despised by the self-righteous religious leaders of his day. This fact, many say, teaches us that Christ went out of his way to build friendships with the lost. Since we should follow Christ’s example, we should also strive to build relationships with unbelievers around us. Certainly we should strive to follow Christ’s example when possible. To do so, however, we need to make sure we realize the full extent of what he did. In other words, if we say we are going to follow Christ’s example, then we’d better go all the way with it, at least with respect to the areas of his ministry that we are able to imitate. Although we don’t perform miracles such as multiplying loaves and fishes, curing the blind, raising the dead, and healing the sick, there are two major aspects of his ministry that we can, in fact, imitate: preaching and relationships. The challenge for us is to avoid elevating one of these over the other. Let’s follow Christ’s example faithfully, reaching out in both word and deed. Mercy ministry without the verbal proclamation of the gospel is not evangelism, while preaching the gospel without acts of mercy is failing to “adorn the doctrine of God our Savior” (Titus 2:10, ESV). Although it’s not always possible to do both, we should strive to keep this twofold goal uppermost in our minds as we do outreach. It has been said regarding evangelism that there are many ways to share the gospel with the lost. “There is no single way to evangelize,” many will claim. In one sense this is true, but statements like this need some qualification. On their own, they could easily be interpreted as supporting a very libertarian, “whatever works” attitude toward evangelism. The risk with this is that we might make the mistake of thinking that even methods of outreach that don’t mention the gospel message at all count as evangelism. That would be a tragic error, though. Nothing can be known about God unless he first reveals it to us. If God chose to never disclose any truth about himself, we would be totally in the dark about him. We would not have the slightest inkling about God, what he expects of us, how we are to be saved, and more. Therefore, revelation is absolutely vital and indispensable for saving faith. It follows, then, that saving faith must be a response to divine revelation, and revelation only. If the above is true, and if it is also true that the gospel is a divinely revealed message, then that message about Christ is non-negotiable. That means that activities that do not communicate the gospel, such as inviting unsaved people over for dinner or living out a pious life before the world, though fine in and of themselves, do not constitute evangelism because they lack revelation. If my life were a paragon of morality and all my nonChristian associates stood in awe of my holiness, and I had the most vibrant, compelling testimony to share with the unbelieving world, yet I never communicated the gospel verbally to them, they would not know what to believe in to be saved. That would be outreach without a message from God, which is no outreach at all. Although it is true that there isn’t just one way to evangelize, it is also true that there is a single common denominator to all genuine evangelism: the revelation of God, specifically, the gospel message. Evangelism is the proclamation of God’s revelation about Christ, the only way of salvation. To omit the message, then, is to omit the very thing that makes evangelism what it is. The church has been given the responsibility to make disciples of all the nations. We are not given the option to hold back the gospel message in favor of some other activity. Mankind’s desperate need for revelation simply does not allow for that, so whatever means we use, we must be sure to begin with the gospel message and continue teaching it. Revelation, by its very definition and nature, must be predominant, central, and of first priority. In my earlier series on friendship evangelism, I made the argument that this approach to outreach is insincere because those who befriend nonChristians to gain an opportunity to present the gospel are operating from an ulterior motive. They have a gospel card up their sleeve, as it were. Christians should avoid this kind of offense at all times, especially when communicating the gospel. If we love our neighbor, we will not manipulate him. Recently I came across a counterargument on a blog in which the writer stated that this was not wrong because all friendships are begun with some kind of self-centered motive. We expect companionship or some other benefit from the friendship. Therefore, the argument concludes, friendship evangelism is no worse than any other friendship because it, too, is driven by a goal of some kind. At first glance this counterargument appears strong, but it quickly falls apart under scrutiny. While it is true that all friendships are begun with some kind of expectation, such as the desire for companionship, it is not true that this expectation is hidden. It is always understood by each person entering the friendship that the relationship will benefit himself or herself in some way. Everyone understands and expects that a friendship will provide certain general benefits to all involved. There is no secret motive. That is not the case at all with friendship evangelism, however. In this approach to outreach, as it is commonly taught and practiced, the Christian is not to disclose the real reason for the “friendship” at the outset, hiding his intention of communicating the gospel so as to first build trust (as if that could somehow bring the nonChristian closer to receiving Christ). In short, in friendship evangelism, the Christian is to hide the gospel behind friendship. That alone should be enough to convince us that friendship evangelism is not evangelism at all, since it does not even proclaim the gospel message! How can any outreach be called evangelism when it keeps silent about the message of Christ? How does God bring about the new birth? by friendship? by our building trust and emotional connections with unbelievers first? No. He brings about the second birth through the word of truth. That is what God has revealed to us in Scripture. Why, then, are so many in the church so determined to avoid using the very means God says is instrumental in salvation? Therefore, we need to proclaim the gospel boldly, not shrinking away from the suffering it will surely cause us sooner or later. We are called, not to please the world, but to proclaim the gospel to it. Whenever we try to please people, inevitably the gospel ends up being pushed into the background. “If I were still trying to please man, I would not be a servant of Christ” (Gal. 1:10, ESV). Pleasing the world and proclaiming the gospel don’t make good companions. One will inevitably be chosen over the other.